Pictured from left during the check presentation are Calvert Chamber of Commerce member Renee Seiden of Chesapeake Beach Resort & Spa; Chamber Chairman Frank Smith of Idea Solutions; CSM Vice President of Operations and Planning Bill Comey; Chamber President Bob Carpenter; CSM Vice President of Advocacy and Community Engagement Michelle Goodwin; CSM President Dr. Maureen Murphy; CSM Foundation Director Lisa Oliver; CSM Trustee Chair Ted Harwood; CSM Director of Development Chelsea Brown; CSM Foundation Chair Nancy Hempstead and Lead Executive Assistant of Advocacy and Community Engagement Toni Kruszka. Accepting that promise, and the $2,000 check, CSM President Dr. Maureen Murphy, expressed her appreciation for her fellow chamber members. First created in 1970, the CSM Foundation is the non-profit and fundraising arm of the College of Southern Maryland. Connecting donors and their goals with the needs of students and the college, CSM Foundation transforms the lives of students by providing access to high-quality and affordable education. Donors help open the doors to higher education in Southern Maryland, close the money gap for students who cannot afford to pursue their educational or workforce training goals, and encourage the achievements of those who choose the college as a path to success. 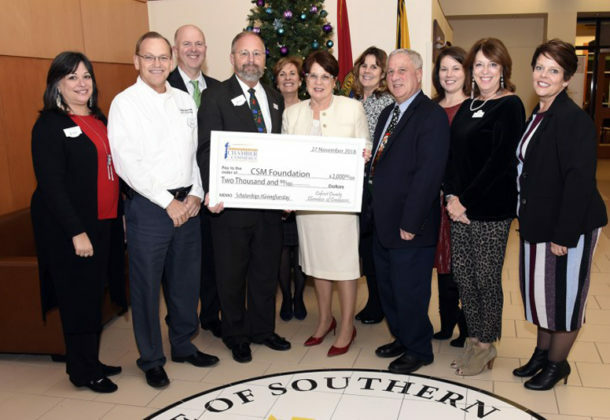 Comprised of an all-volunteer tri-county Board of Directors, the CSM Foundation raises friends and funds to support students and college initiatives. Through the support and investment of generous partners and donors, the CSM Foundation managed net assets of about $12.2 million in FY2017. For more information, visit the CSM Foundation online. The Calvert County Chamber of Commerce is an alliance of more than 400 individuals and businesses who work together to create a strong business climate in Calvert County. The organization’s mission is to be the influential voice of business, creating economic vitality by promoting the business community and its members. For information visit the Chamber online.